Pack the Pier - A Muskegon Boating Tradition. 4th of July. Pack the Pier: Boat Rally and Raft-up. July 4 is a special occasion, but in Muskegon we do it right. Let's Pack the Pier! How many boats can we pack into the North or South Breakwater Cove? Let's enjoy the Lake Effect. Bring your coolers, rafts and loving spirit as you celebrate the 4th of July. 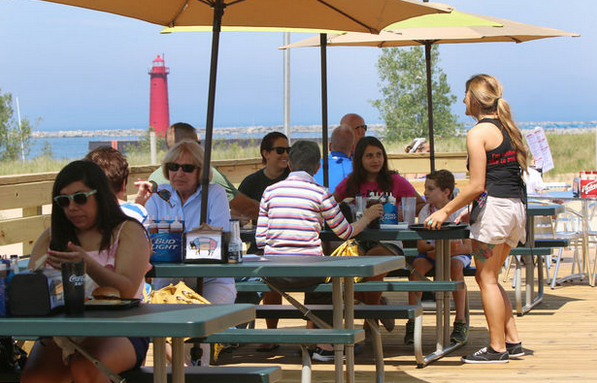 The Deck (Muskegon's great beach restaurant) will provide some music and refreshments. The Deck is accessed by a short walk from the South Breakwater Cove. Anchor and enjoy a great Michigan tradition. The celebration continues as people enjoy the lake effect on July 4 with family and friends in the Breakwater Coves of Muskegon, Michigan. Join us as over 100 boats gather for a great time.